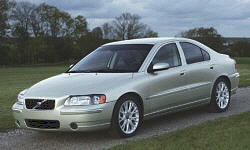 Why the 2006 Volvo S60? Interior is comfortable, warm and detailed. Seats are extremely comfortable. The radio is ear-splitting loud and sounds great. Creature comforts are plentiful. Controls are straight forward. This car has 300 hp and 295 ft lbs of torque. Bottom-end performance is strong and shifts are positive. The power inspires confidence in the driver. Fear to pass becomes a passing fear with this car. For a sport-sedan, this car gets great mileage. 50/50 driving is an average 20.5 mpg for me. 90/10 driving is 24 mpg for me. I pick up speed quick and then light foot my way down the road. Average temperature is 32F which can impact my mpgs. Why Not the 2006 Volvo S60? Stock iPod compatibility is poor. The stereo will not allow the user to select playlists. The iPod connection will not charge the iPod. An aftermarket iPod interface is recommended. Ride height can be an issue for some people. It would be easy to run the front end of this car into curbs in the parking lot. The driver has to be mindful of ride height. The ride may be too stiff for those seeking an "average" ride from your "average" mid-class sedan. The ride is that of a sports car. Buyers should be aware of this.